Mr. Enrico Preziosi said this was one of the worst matches since he is our President. Against Lazio we had to win to keep the last week in Parma returned European dream alive. It looked like the players did not believe in the dream, or maybe they are tired after match 44 (35 Serie A, 8 Europa League and 1 Coppa Italia) this season with so many injuries. Just as the last 2 seasons we lost at home against Lazio: 1-2. 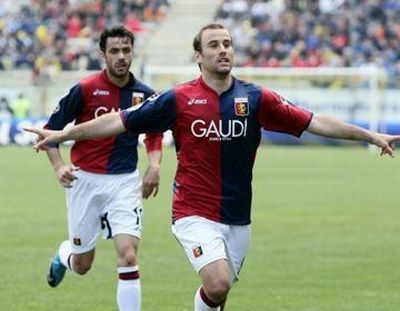 In the 8th minute Genoa took the lead with a great shot of Palacio, who scored his 3rd goal in 2 matches. After this goal Lazio became stronger and stronger and halfway the first half defender Dias headed a corner behind Alessio Scarpi: 1-1. Only a few minutes later Lazio also took the lead when Mesto played the ball towards his old teammate Sergio Floccari who since January plays on rent with Lazio and easily scored: 1-2. 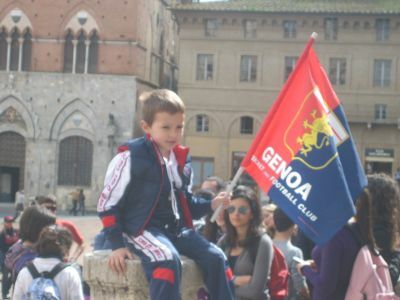 In the second half Genoa of course was the strongest team in the field but minute by minute it was more clear that the European dream is over, especially after Bocchetti got his red card 20 minutes before the end. We had a dream, game over ! The last 2 seasons in Serie A we had a fantastic central-forward who scored almost 50% of all our goals. After Marco Borriello and Diego Milito, we miss such a great topscorer this year. But Mr. Gasperini found the solution and again in the Dutch way: the wing-players ! 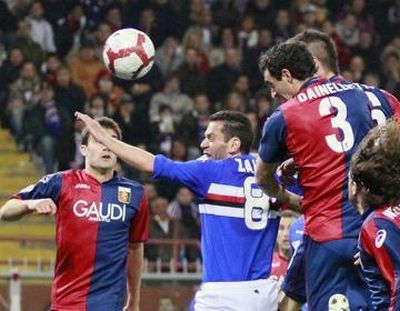 Yesterday Genoa scored 3 times: 2 goals by right wingplayer Rodrigo Palacio and the 3rd goal by Ivan Fatic who was only 30 seconds in the field when he scored. Again a good substitution of our brilliant coach. Ivan Fatic already was our 18th player who scored this season which is a record. The victory brought us back on the 8th position in the standings, just 1 place outside the Europa League zone. Sunday we play at home against Lazio and another victory is nescessary to keep the European dream alive. 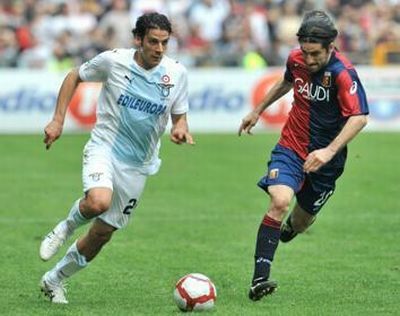 With Alessio Scarpi in the goal and Marco Rossi in midfield Genoa started version 102 of the derby della Lanterna. In the first 23 minutes Sampdoria was the strongest team in the field, but after the goal of Ca$$ano it was only the red and blue team that played football. Several chances were missed, a goal of Sculli was regulary annulated because of off-side and the biggest chance was missed by Bocchetti in the 90th minute while Dainelli was in a much better position just a few centimetres behind him. After 3 victories a defeat in the derby, but a draw should be a much more honest result. Tomorrow at 20.45: derby, the 4th in a row ?! The wetter, the friendship between the fans of both teams and the whole atmosphere was fantastic to a great match in Toscany last Sunday. 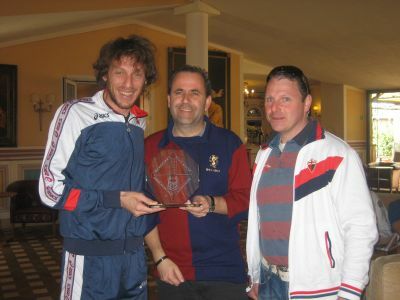 Unfortunately the goalkeepers Curci and Ameli were the best players in the field and unbeatable. 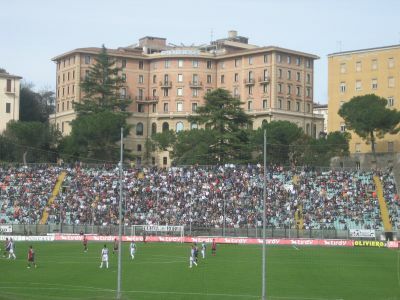 Genoani Marco Rossi and Raffaele Palladino and striker Ghezzal of Siena almost scored, but the 0-0 stayed till the end on the scoreboard. Both teams were not very pleased with the draw.